Jens Diercks, born in Kiel, West Germany and trained as an artist in Vancouver. He produces sculpture of the discarded refuse that surrounds him and all of us. 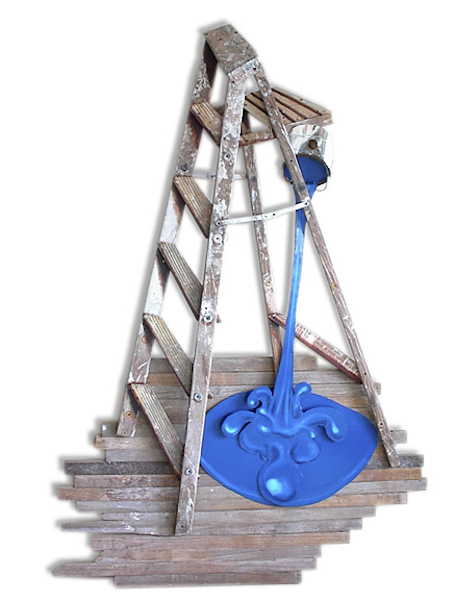 Junked stepladders and pianos, suitcases and chairs are the objects of everyday use that he transforms. In a process he calls Function Destruction he compresses the three-dimensional object into a shallow relief, a visual skeleton in his words, while revisioning the shapes indispensable to the object’s identity and adding color and texture to bring out its distilled essence. The chair is the special focus of Diercks’ transformations. Pondering Duchamp’s questionings of art itself and buoyed by Clause Oldenburg’s humorous and surprising representations of ordinary objects, Jens Diercks recruits abandoned chairs to join him in arriving at his platonic abstraction of their particularity. Diercks claims that indeed the chair participates in its own ideal depiction. In the resulting wall reliefs, the deconstructed/reconstructed chair and its twinned idea (in our mental picture of chair) combine to double the energy and presence of these strong and original sculptures.